I made what small splash I did in the poker media world almost five years ago, with a couple of articles, a blog post here (“In the Money”) that turned into my first article for PokerNews (condensed as “The Tough Road for a Poker Tournament Pro”). When that hit the internet, DEADSPIN contacted me about reprinting the original blog post (with the clickbait title “Why You’ll Never make a Living Playing Live Poker Tournaments”). Over the next couple of years I did a number of articles with data visualizations here at Mutant Poker, and at PokerNews (see the Articles page for the external links). Payout structures, chip graphs, performance simulators, all sorts of good stuff. I started pouring myself into poker at a time when I’d burned through the small 401K I’d built up when I had a real job trying to keep afloat as a freelance programmer. After the 2000 tech crash, my income dropped drastically, by about $50K a year (and that was a pretty important $50K), so by 2016 when I got the summer gig working for the WSOP, I figure I was down about half a million in income, part of which would have funded my encroaching decrepitude. Poker for me, has been both a welcome diversion from thinking about where I went wrong, and—as it turned out—a small source of income that held out faint promise of recouping some of the retirement money I didn’t have. Better than the lottery, anyway. The end of 2018 marks the end of my 10th full year of playing poker in this phase of my life (as opposed to the nickle-ante five-card-draw games I played in my 20s) and I’ve got one more chart to drop before the year is out. It’s probably going to be the last one I do, because—like everyone else—I’m retiring from poker at the end of the year. No, I’m not going into crypto, but my wife is finally retiring after a quarter-century at a stressful job, and apart from the occasional home game with the guys I started out with (thanks, Kelly! ), I’m going to step back to spend more time with her. Meanwhile, I’m going to play as much poker as I possibly can. So here goes. If you’ve been following my posts over the past year or so, you have probably seen the PNW Poker Leaderboard feature. The leaderboard database has about 3600 players from Oregon, Washington, and Idaho—the “Devil’s Triangle”, if you will—of poker in the USA. The chart below represents every single one of those players. Not specific players, but each player with $3K or more of recorded lifetime earnings on The Hendon Mob is there, organized by earnings and state. The data here is sort of a callback the article I mention above, because you’ll see the distribution of earnings looks a lot like a poker tournament’s payouts (or capitalism! ): there are a lot of people with a little money and there is a slice at the top with an absurd amount of money. Between them is a smaller, stratified group doing better than the masses, but nowhere near the folks at the top. The numbers are drawn from the amounts on the various states’ leaderboards at The Hendon Mob, which don’t include recorded dailies or recurring tournaments, or (obviously) untracked tournaments. 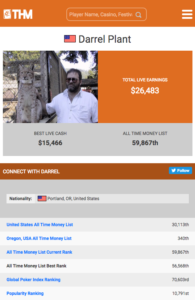 My own measly page, for instance, shows about $26.5K in earnings but $2K of that isn’t counted on the Oregon leaderboard because it was in a Venetian regular-schedule tournament. But all-told, over the seven-and-a-half years since Black Friday when I seriously started playing live outside my home game, I’ve cashed for over $160K; most of that’s been in local tournaments, however, which are untracked outside of the computers at The Players Club, Final Table, Encore, and Portland Meadows. There’s a lot of churn in that number—apart from this year the poker’s been marginally profitable at best, with buyins matching cashes pretty closely. Still, while I’m no Ali Imsirovic, my modest record (coming mostly from 3rd place at the PACWest Poker Classic this spring) puts me in the upper third of all of the players in the Northwest. One metric I used in my articles on professionally playing live poker tournaments was making a decent annual income, which means a decent annual profit. I used $60K/year as a benchmark. My $16K/year average in tournament cashes doesn’t even come close, even if all of it had been profit. And this is the point at which I point out that fewer than 15% of the players in my records have $60K in lifetime earnings. Not annual, and not profit. Based on my previous estimates, the average long-term player would need to make $300K/year playing tournaments to turn a $60K/year profit (that’s an optimistic calculation). Fewer than 90 players out of 3600 Have made $300K in their lives. And those $300K earning years add up pretty fast if you’re planning to stay in the game for a long time. The bottom end of the top 1% starts at $750K. So that’s the story. I started the original by quoting Bryan Devonshire saying that poker pros need to mix in cash games with their tournament play in order to stay profitable. I’m just going to reiterate that. Again. Enjoy! Each box represents a player from the US Pacific Northwest tracked on The Hendon Mob, with $3K or more in live tournament earnings. Colors indicate the total amount of tournament winnings, according to the individual state’s leaderboard (which does not include daily events). Shades indicate the number of players from each state /within the range of recorded tournament winnings.